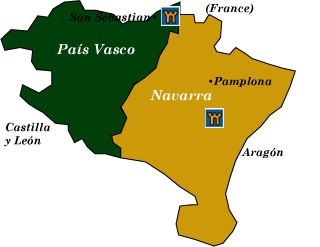 As the name implies, the País Vasco is the autonomous region of the Basques. Known as Euskadi in the Basque language (Euskera, which is completely unrelated to any other language on the continent), you’ll find one of the oldest indigenous cultures of Europe. Despite the political events that bring the Basques to the forefront of the news, the region is safe to travel in. The dynamic and prosperous cities of Bilbao and San Sebastian sparkle against a coastline of rocky coves and wide bays, and verdant rolling hills full of rural charm. Navarra is a delightful province to visit 51 weeks of the year. But from 6-14 July, when the “Running of the Bulls” occurs in Pamplona, the surrounding area is filled with the spillover of party-animal tourists. When they leave, the streets and towns empty, and once again you can peacefully explore this area in the lush Pyrenees Mountains that is dotted with unspoiled, charming little villages. Bilbao (Bilbo) A leading commercial port and center of industry, Bilbao is home to the extraordinary architectural wonder designed by American Frank O. Gehry: the Museo Guggenheim. With an emphasis on modern and contemporary art, most of the exhibits on display are temporary shows and major retrospectives. Not to be overlooked, the Museo de Bellas Artes is one of Spain’s best art museums with paintings by Zurbarán, El Greco, and Goya on display. San Sebastián (Donostia) Wonderfully situated on a beautiful shell-shaped bay, San Sebastian makes up for its lack of big attractions by its hipness. A popular aristocratic resort since the 19th century, its fame today comes from its great summer arts festivals and the San Sebastián International Film Festival in September. The renowned Basque cuisine may be sampled in its multitude of tapas bars. Vitoria (Gasteiz) Fortified in 1181 by King Sancho el Sabio, the narrow lanes, picturesque slopes, delightful plazas and churches of the casco viejo, or old town, are fun to explore. One of the more quirky museums to visit is the Museo Fournier de Naipes. Installed in a 16th-century palace, this remarkable collection of 6000 items is devoted to the playing card, with some dating back to the 14th century and other designed by Salvador Dalí. Pamplona (Iruña) El Encierro, or running of the bulls—made famous in Ernest Hemingway’s The Sun Also Rises in 1926—is now a magnet for visitors from all over the world to drink and party 24/7 into a stupor. Marching bands start early in the morning, followed by bulls thundering along with white-dressed runners through the narrow streets. Bullfights and celebratory drinking in the evening finish things off—all to be repeated the next day. The Pyrenees The section of the Pyrenees that lies in Navarra presents opportunities for nature lovers to enjoy trekking, fishing, and skiing. The town of Roncesvalles sits near a mountain pass, which both ancient and modern pilgrims cross on the way to Santiago de Compostela. Famed for its connection to the legend of Roland, Roncesvalles today is known for its 13th-century Gothic church Real Colegiata de Santa María and the surrounding monastery complex. Estella I discovered this town in the summer of 2006 while walking the Camino de Santiago. Pleasantly situated on the Río Ega, the former 12th-century capital of the kings of Navarra is a treasure trove of Romanesque architecture with its Palacio de los Reyes de Navarra and various Romanesque churches. Nearby, the Monasterio de Irache and the Monasterio de Iranzu are worthwhile excursions.